TNSR is an open-source based packet processing platform that delivers superior secure networking solution performance, manageability, and services flexibility. TNSR can scale packet processing from 1 to 10 to 100 Gbps, even 1 Tbps and beyond on commercial-off-the-shelf (COTS) hardware - enabling routing, firewall, VPN and other secure networking applications to be delivered for a fraction of the cost of legacy brands. TNSR features a RESTCONF API - enabling multiple instances to be orchestration managed - as well as a CLI for single instance management. TNSR Business is designed for users who have secure networking products with up to 10 Gbps network interface cards (NICs), making it a viable replacement for users with moderate bandwidth secure networking needs. TNSR Business is available from the Netgate store as a bare metal installer for hardware or virtual machines, or pre-installed on select Netgate hardware. Each licensed instance comes bundled with TNSR Business Technical Assistance from our 24/7 world-wide team of support engineers, and it can be upgraded to TNSR Business Plus for even faster response times. TNSR Enterprise is designed for enterprise and service provider users who want a full-featured secure networking software solution. TNSR Enterprise is the right choice for throughput needs that range from 10 Gbps to terabits per second. Call us to begin a conversation about your needs. We’ll be happy to help. Each licensed instance comes bundled with TNSR Enterprise Technical Assistance from our 24/7 world-wide team of support engineers. Both TNSR Business and TNSR Enterprise have 120-day trial versions available. You can visit the pricing page of tnsr.com to find out full details on how the trial works. 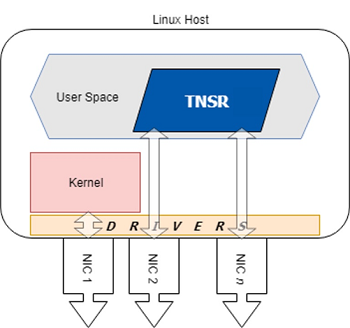 TNSR runs on a Linux host operating system. Initial configuration of TNSR includes installing associated services and configuring network interfaces. It is important to note that network interfaces can be managed by the host OS or by TNSR, but not by both. In other words, once a network interface is assigned to TNSR, it is no longer available - or even visible - to the host OS. A little background. TNSR is the result of Netgate development, using many open source technologies to create a product that can be supported and easily implemented in production environments. 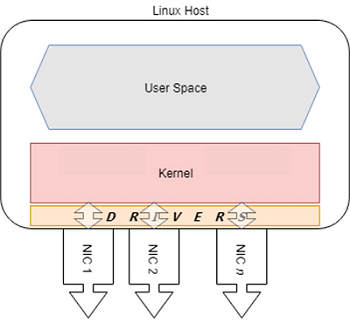 Without TNSR, Linux systems use drivers to plumb the connections from hardware interfaces (NICs) to the OS kernel. The Linux kernel then handles all I/O between these NICs. The kernel also handles all other I/O tasks, as well as memory and process management. In high I/O situations, the kernel can be tasked with servicing millions of requests per second. TNSR uses two open source technologies to simplify this problem and service terabits of data in user space. Data Plane Development Kit (DPDK) bypasses the kernel, delivering network traffic directly to user space, and and Vector Packet Processing (VPP) accelerates traffic processing. In practical terms, this means that once a NIC is assigned to TNSR, that NIC is attached to a fast data plane, but it is no longer available to the host OS. All management - including configuration, troubleshooting and update - of TNSR is performed either at the console or via RESTCONF. In cloud or virtual environments, console access may be available, but the recommended configuration is still to dedicate a host OS interface for RESTCONF API access. The recommended configuration of a TNSR system includes one host NIC for the host OS and all other NICs assigned to TNSR. What is Vector Packet Processing? Vector processing handles more than one packet at a time, as opposed to scalar processing which handles packets individually. The vector approach fixes problems that scalar processing has with cache efficiency, read latency, and issues related to stack depth/misses. For technical details on how VPP accomplishes this feat, see the VPP Wiki. This documentation assumes the reader has moderate to advanced networking knowledge and some familiarity with the CentOS Linux distribution.